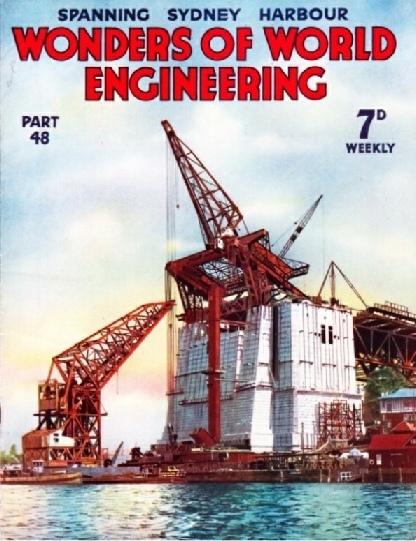 Part 48 of Wonders of World Engineering was published on Tuesday 25th January 1938, price 7d. 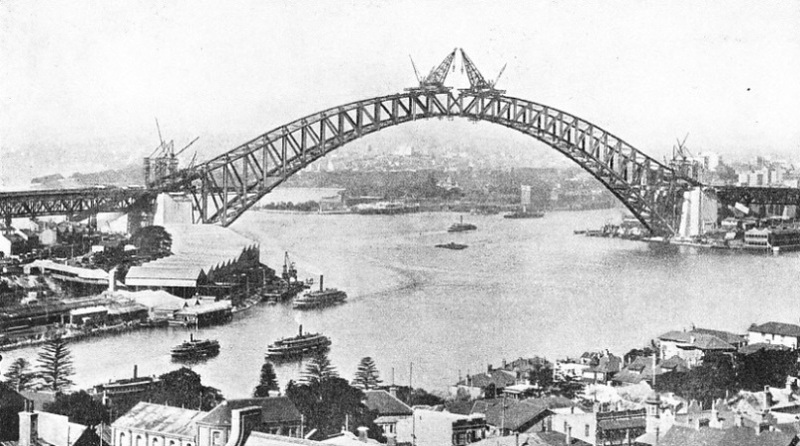 Part 48 includes a colour plate showing the first panel of the great arch of Sydney Harbour Bridge. It formed part of the article on Spanning Sydney Harbour. The colour plate also appears on the cover of this part. The cover this week is reproduced as a colour plate, and was supplied by Dorman Long and Co. Ltd, the British firm responsible for the building of Sydney Harbour Bridge. 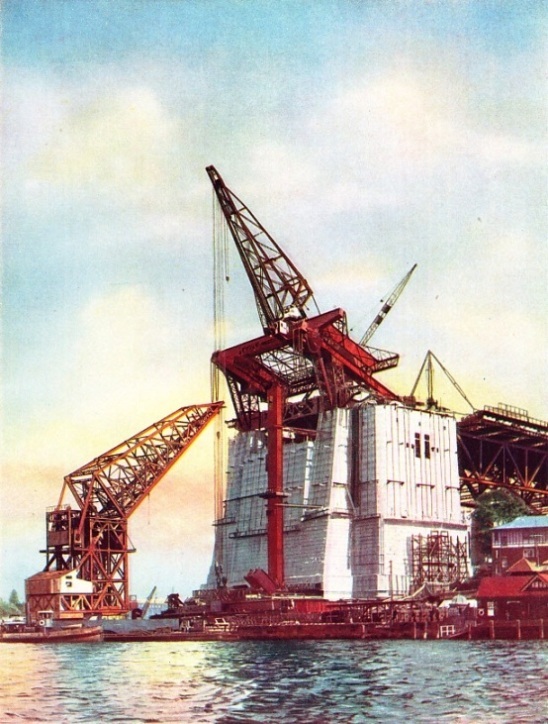 The cover shows the building of the first panel of the great single-span arch from one of the massive pylons. The creeper crane on the upper chord of he arch is being assisted at this juncture by a large floating crane. From the Droitwich transmitting station of the British Broadcasting Corporation there are radiated simultaneously two separate programmes - National and Midland Regional, on long and medium wavelengths respectively. The long-wave national transmitter serves nearly the whole of the British Isles. The Droitwich Broadcasting Station holds a place of unique importance in the British Broadcasting Corporation’s transmission system. The chief outward mark of this station, standing alone in the fields of Worcestershire, are the aerials, supported by two steel masts 700 feet high; but inside the station presents a vivid impression of controlled power. This chapter is by P R Bird. WHEN A VALVE BURNS OUT in the long-wave transmitter, the replacement is expedited by mounting the new valve in a rubber tyred trolley which protects the delicate apparatus from damage in transit. Entrance to the inside of a transmitter unit to change a valve would automatically cut off the power if this had not previously been done. 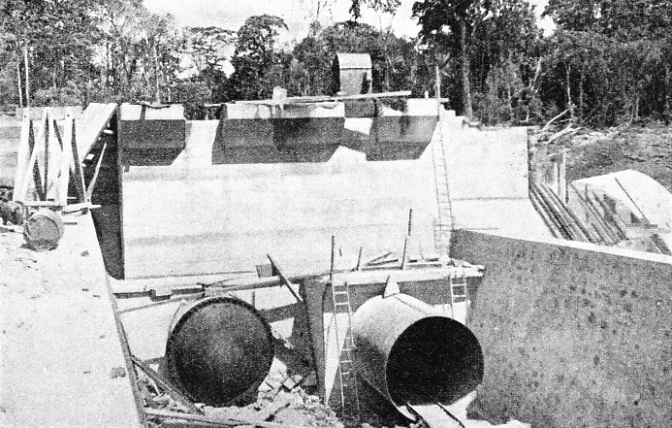 A construction of a hydro-electric station in the centre of the jungle supplies power to several factories near the Pangani River Falls in Tanganyika. 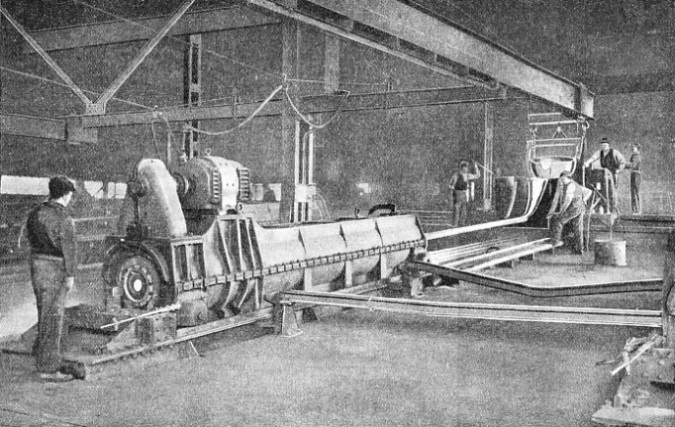 This chapter is by Howard Barry, and is the seventh article in the series Wonders of Water Power. The article is concluded from part 47. A SINGLE SPAN OF 1,650 FEET was built across Sydney Harbour to link Milsons Point (left) with Dawes Point (right), adjacent to Sydney Cove, the site of the first settlement in 1788. The main span is formed by two parallel arches, 98 feet apart, connected by cross-girders. Upper and lower chords are connected by vertical struts with diagonal bracings. GATE SECTION OF THE INTAKE DAM, located at the foot of the Upper Rapids, not far above the main fall on the Pangani River. The spillway section of the dam is 250 feet long; the intake works consist of the mass concrete section illustrated above. On the right is the connexion to the pipe line; on the left is another connexion which may be used later with a second pipe line. The sluice gates are operated by hand, but an automatic closing device has also been installed. THE FIRST PANEL of the great arch of Sydney Harbour bridge being built out over the harbour form one of the massive pylons on the shore. On the upper chord of the arch is a creeper crane, destined to travel along the upper chords as the work advances. A large floating crane is assisting in the work of building the first panel. Similar operations were carried out from the pylon on the opposite shore. When completed the two half-arches met to form a single span of 1,650 feet. This colour plate also appears on the cover of this part. The tendency of an object to fly outwards from the axis round which it is rotating has been applied to diverse uses. Pumps, purifiers, separators and governors have been devised to work on this principle of centrifugal force, which has its applications in countless engineering activities. Of the forces of Nature, wind and water have been harnessed by engineers throughout the centuries for the generation of power; but there is another natural force which plays an important part in modern engineering. Centrifugal force causes a rotating body to fly off at a tangent, if it can. This chapter, by Rolt Hammond, touches on the many applications of centrifugal force in engineering. One of the earliest examples of the application of centrifugal force is the governor, devised by James Watt. This remarkable safety device, designed to prevent a rotating shaft from running dangerously fast, has undergone many modifications since his day, but it remains unaltered in principle. Another remarkable application of centrifugal force is its use in the casting of iron pipes. Many kinds of pumps, separators, purifiers, switches and other devices make use of this natural tendency. A familiar instance is the fluid flywheel fitted to certain motor cars. CASTING IRON PIPES by a centrifugal process in the Stanton Ironworks, near Nottingham. Molten metal poured from a ladle runs down a trough into a cylindrical mould which is revolving about its own axis. Centrifugal force causes the molten metal to form a layer on the inside of the mould, where it quickly solidifies and whence it is withdrawn as a pipe. The period between 1905 and 1914 saw the introduction into the motor industry of many names which have since become famous, and of many inventions which have contributed to the efficiency of the modern motor car. In this further chapter, by F E Dean, the author deals with the history of the motor car from 1905 up to the war of 1914-18. Two further chapters in this series are planned, which will bring the story of the motor car right up to date. This is the fourth article in the series on the Story of the Motor Car. TWO AUSTIN SEVENS - the first single-cylinder 7 horse-power car produced in 1910 and the familiar 1937 four-cylinder saloon. The prototype of the four-cylinder model did not appear until 1922, but the 1910 model won fame as a light and economical car. The great arch which rises majestically above Sydney’s magnificent harbour, in the heart of Australia’s largest city, is a triumph of British engineering. From 1925, when the work was begun, until 1932, when the bridge was opened, navigation was not interrupted. In this chapter Lieut.-Com. R T Gould describes the building of this bridge. The contract for the bridge was allotted in March 1924 to Dorman Long & Company, the British firm which was responsible also for the building of the Birchenough Bridge, described in Part 22. The main arch of Sydney Harbour Bridge is formed by two parallel arches 98 feet apart connected by cross girders. Each arch consists of an upper and lower chord formed of tubular box girders and connected by vertical and diagonal struts so that in profile each arch appears to be composed of a series of huge N’s. The whole weight and thrust of the arch are transmitted to the piers through four enormous hinges, or bearings. With its approach spans Sydney Harbour Bridge has a total length of no less than 3,770 feet. As the half-arches were built out across the harbour from either shore, their weight was supported by a number of wire cables anchored in U-shaped tunnels from the shore. Enormous creeper cranes on the upper chords of the arches handled the members as the structure advanced across the harbour. The bridge was formally opened on March 19, 1932. This is the sixteenth article in the series Linking the World’s Highways. You can read more about the Sydney Harbour Bridge in Railway Wonders of the World. Piercing the immense barriers of the Alps are four long tunnels - the Mont Cenis, St Gotthard, Simplon and Lotschberg - which were, at the time of their building, unprecedented triumphs of engineering skill. The four great Alpine tunnels form a group which is unrivalled elsewhere. Burrowing beneath the mountain masses of the Alps, these great tunnels link the railway systems of several countries. The work of building these tunnels is described in this chapter by Lieut.-Com. R T Gould. This is the tenth article in the series Below the Surface. The article is concluded in part 49. You can read more on the St Gotthard and the Simplon Tunnel in Railway Wonders of the World. THE SWISS ENTRANCE to the Simplon Tunnel, which links Switzerland and Italy. The tunnel is about 12¼ miles long, and was begun in 1898. Two parallel tunnels, about 56 feet apart, were driven, only one immediately being enlarged to full size, 13 ft 7-in wide at floor level and 18 feet high. The second tunnel was enlarged by 1921. Electrically operated curtains close the entrance when trains have passed. 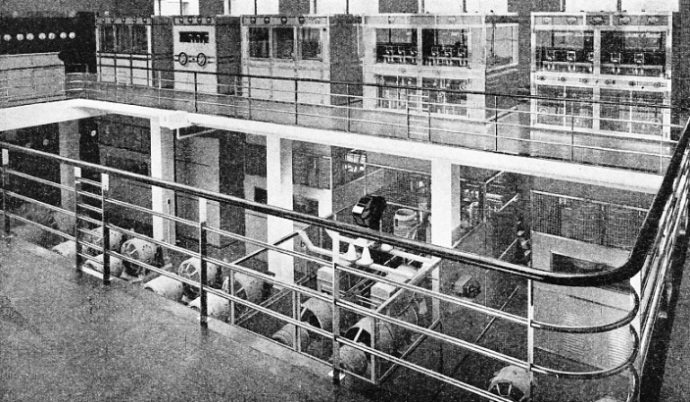 THE LONG-WAVE TRANSMITTER at Droitwich is mounted along one side of the transmitting hall, facing the Midland Regional transmitter, on the opposite side of the hall. 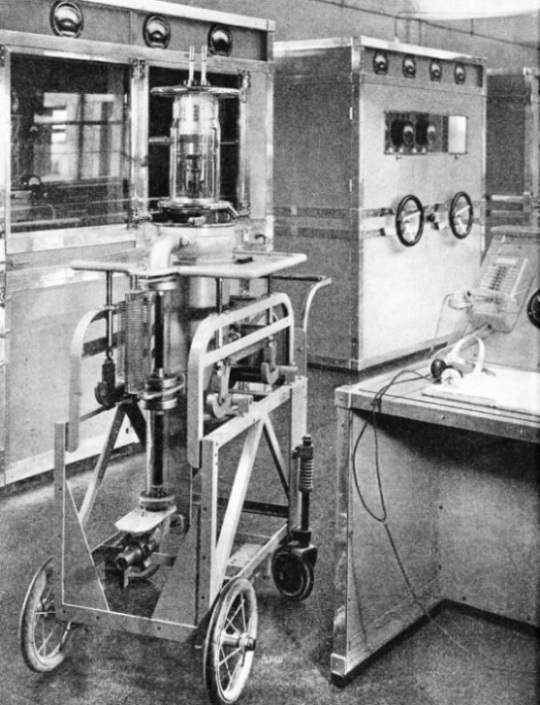 The arrangement of the units on a gallery enables the filament-current machines to be housed immediately below their respective valve units. 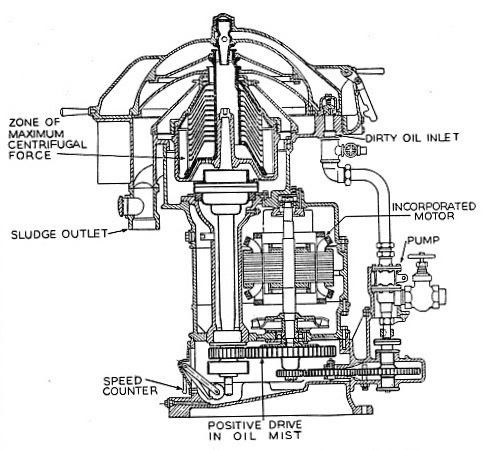 SECTIONAL DIAGRAM of a centrifugal oil purifier showing the principal working parts.